So that's where it originally came from! (SPOT.ph) Halo-halo. It’s the quintessential Pinoy sweet treat that lets you beat the heat all year round. Nothing tops the combination of crushed ice and layers of sweet beans, tapioca, gulaman, macapuno, ube, and sliced fruit, topped with a hefty scoop of ice cream and a mouthwatering slice of leche flan. You may have grown up with this classic Filipino dessert and merienda, but we’re pretty sure you don’t know everything about it. 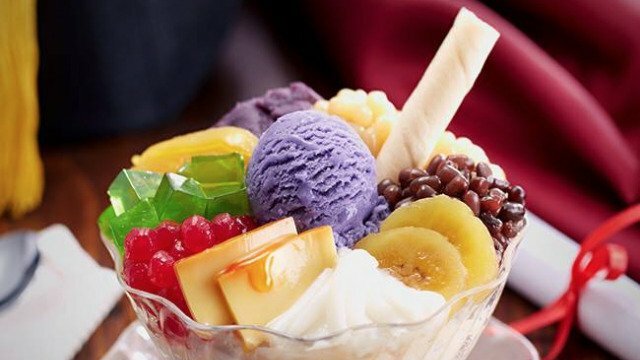 Here are a few fun facts about halo-halo you probably didn’t know. One might think that the tropical weather inspired the locals to design this cool, colorful treat, but halo-halo actually originates from the Japanese shaved-ice dessert. It was before World War II when the Japanese brought this sweet refreshment to the country, where it was given a Pinoy twist! The Japanese called it “mong-ya” because they used mung beans as one of the ingredients for the shaved ice dessert—which was a novel concept to Filipinos during the Japanese occupation. In fact, halo-halo from different regions in the Philippines look and taste different from each other because of the different combination of fruits and other ingredients endemic to each location! One thing remains, though—it’s always a refreshing delight no matter where you go. …and has even been dubbed “oddly beautiful” by popular food critics. Most of the time, our exotic dishes get more attention overseas but halo-halo has been recognized all over the globe for all its icy and delicious glory. An American food magazine even came up with their own version of the tropical treat by throwing in gummy bears and popcorn into the mix. Because what’s not to celebrate about this classic Filipino dessert and merienda? Last March 19, over 450 Mang Inasal stores nationwide participated in the National Halo-Halo Sarap Day wherein customers got to enjoy an all-day Pinoy Halo-Halo promo for only P25 (small) and P45 (large)—letting them save P28 per order. It was an eventful day as local celebrities Angel Locsin and Coco Martin celebrated at the Mang Inasal SM East Ortigas and SM Fairview branches, respectively. It was surely a treat for everyone who came to celebrate halo-halo at Mang Inasal! Don’t worry if you missed out—you can always catch Mang Inasal’s next National Halo-Halo Sarap Day!